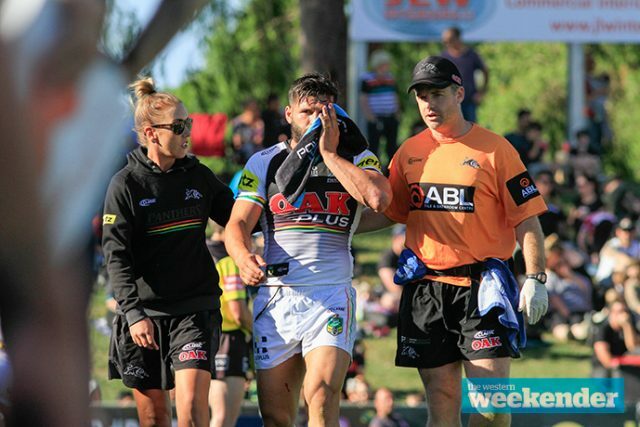 Josh Mansour will make his long-awaited return from injury against the Broncos next Friday night. The 28-year-old has been out since Round 6 when he suffered that horrific facial injury against the Titans. He’s refreshed and ready to go, and is keen to make a big impact on the club’s run towards the Finals. They say where there’s smoke, there’s fire and while there may not be an out of control blaze at the Panthers, there’s no denying that some issues do exist with coach Anthony Griffin. At the core of the issue is Griffin’s controlling nature, which has ruffled a few feathers within the camp, particularly members of the club’s medical staff. As I’ve said previously, any suggestion that Griffin is on his way out the door is probably off the mark but there’s certainly some internal issues that need to be sorted out. Penrith officials will play this carefully as they want to avoid any serious disruption given the side’s current success with a possible top four finish looming. I’m hearing the Gold Coast Titans were keen to broker a deal that would have seen Bryce Cartwright return to the Panthers in 2019. 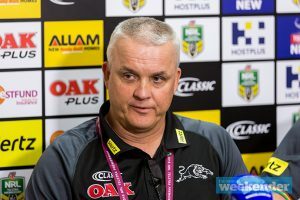 The change of scenery for Cartwright has failed to fix many of the issues that plagued him at the Panthers in the last couple of seasons, despite his strong relationship with Titans coach Garth Brennan. The Titans are now trying to offload Cartwright and while a clause does exist that Penrith needs to be offered first opportunity, there’s no real desire to have him back at the foot of the Mountains. Spotted: A number of Penrith’s young brigade including Tyrone May and Jack Hetherington carb loading at Product of Italy in Penrith last Thursday night, ahead of the clash with the Warriors. Spotted: Penrith forward Trent Merrin sporting a very trendy knitted jumper at High Street Depot last Thursday morning. 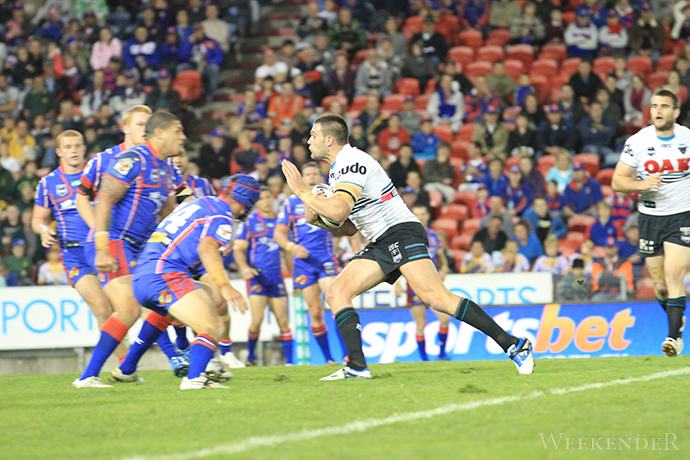 Tim Grant playing for the Panthers. Scoop confirmed: I told you last year that Tim Grant was looking to return to the Panthers and while it’s taken longer than he would have liked, the 30-year-old will be back at the foot of the Mountains next season. Grant has signed a one-year contract understood to be worth around $120,000 and is likely to move into the club’s sponsorship team once he retires. “Even though rugby league is now a business and players move around, there is one club that will always be your club. For me that club is Panthers,” Grant said. Another player returning to Penrith next year is Wests Tigers winger Malakai Watene-Zelezniak. The Panthers won’t announce the deal until the end of the season but lock it in – the Watene-Zelezniak brothers are back together in 2019. Those rumours about Nathan and Ivan Cleary heading to the Roosters as a package deal have been put to bed with the Bondi club re-signing coach Trent Robinson to a long-term deal. The Cleary sideshow has now turned to Brisbane, with rumours the father and son duo could be heading north. It’s all paper talk at this stage – as he has said numerous times, Nathan won’t focus on his next contract until all is said and done with season 2018. The Jarome Luai fan club has grown extensively since his sensational performance against the Warriors last Friday night, but it had 31 members initially. 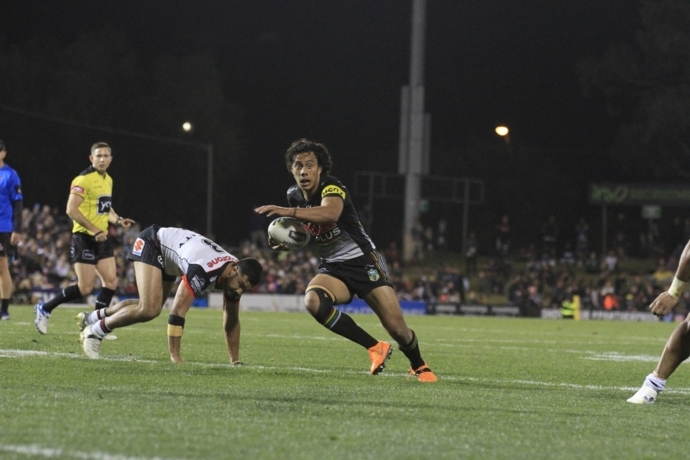 That’s how many tickets Luai secured for his close family and friends for last weekend’s game. They won’t forget his performance in a hurry. Talking of Laui, the Panthers now face the issue of his price tag almost tripling overnight. The youngster is off-contract at the end of 2019 and if Nathan Cleary does re-sign with the club, the 21-year-old may look elsewhere in a bid to lock down a permanent first grade spot. It’s certainly created a tricky headache for Phil Gould as the club tries to work out its salary cap compliance for the coming seasons. There’s more bad news on the injury front with fullback Dallin Watene-Zelezniak to miss at least the next three games with a hamstring injury. The NRL clash between Penrith and the Warriors at Panthers Stadium last Friday formed the backdrop to The 24-Hour Challenge – a key initiative of the club’s Building Young Men (BYM) program. BYM is an annual 20-week mentoring program that brings together a group of male high school students with current and past NRL players, successful businessmen and community leaders. The Challenge saw the boys and their mentors walk continuous laps of Panthers Stadium.